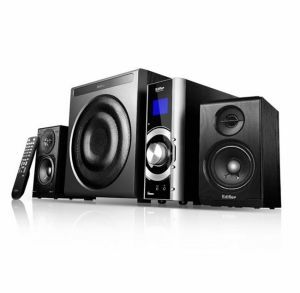 The C5 by Edifier, is a high end, high powered 2.1 multimedia component audio system. The C5 produces deep and powerful bass performance from its wooden enclosed front firing 8 inch side-ported subwoofer, while the matching 2-way dual driver satellites assist in providing massive sound with a total power output of 53 watts. Its vertical stand alone amplifier houses an FM radio with 6 user present channels, USB and SD card reader input slots and both PC and auxiliary inputs. Both the LCD display and infrared wireless rremote allow for ease of control over all operations and functions.